I’m running late with my writeups because I’m exhausted, and today’s schedule was emotionally and physically draining – far more so than anticipated. When I was young, I had a dream of being an astronaut. I rapidly realised it was unlikely, if only because Britain wasn’t send anyone into space, but like many my age my imagination was caught by the Space Shuttle program. Between that, and a diet of Star Trek, Star Wars, Battlestar Galactica, Buck Rogers and anything else falling into the broad description of science fiction, I’ve continued to have a fascination and love of space, and of stories set in space, up to and including Guardians of the Galaxy. I have a fascination for knowing the how, who and why of everything, so I’ve wanted to get to the Kennedy Space Centre for many years. When we were planning this holiday, we realised that it was an hour’s drive or so from our hotel, so there really was no better chance to get there. With this week’s driving experience bolstering my confidence we headed out. Lady M’s emotional investment in this journey was similar to mine, inher case an early ambition thwarted by failing eyesight. It was blazingly hot when we got there, with temperatures reaching 36C and making locals complain about the heat, which made us feel better about being uncomfortable. 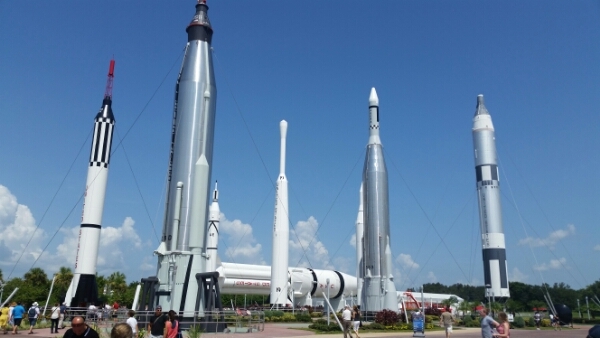 The first sight that met us was the Rocket Garden, with examples of each of the rockets developed during the Kennedy-era space race. The milestone launches, key inventions and principles are all documented here, painting a vivid story that I found more affecting than I anticipated. I hadn’t been entirely sure what else I’d find here, but knew there was a bus tour somewhere, so we went looking for it, passing a number of other exhibits in separate buildings. There was indeed a tour, crammed with technical and historical detail that came thick and fast enough to make me feel a little punch-drunk, so by the end of it our stumbling into the Atlantis exhibit was more accident than design. The booster rockets and fuel tank used by the shuttles stood outside the otherwise plain building. Our wait in the queue was short, surrounded by quotes from engineers, directors and pilots, and by images of the space shuttle program. This in turn led to two short films. 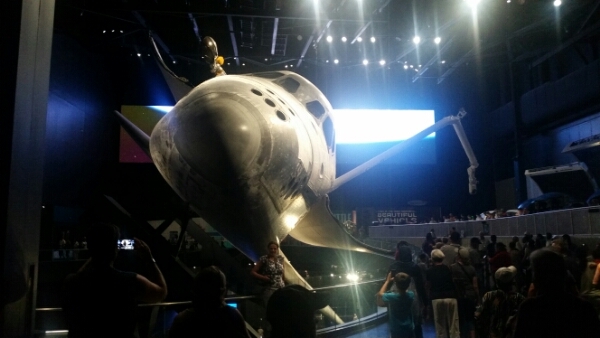 The first was a lightly dramatised account of the program’s history and development, followed a second film in the next room showing images of launches, mission photography and film – in short an elegy to the now decommissioned fleet that ended in the back wall rising up to reveal the Atlantis shuttle herself on display. I’ll admit here Lady M and I had tears flowing down our faces. The music, the setting, our own sublimated childhood dreams, our knowledge of the history and tragedies along the way, all came together in the face of this beautiful piece of engineering that had come to epitomise for us humanity’s push to explore and expand out into the universe. My daughter left us to it and inspected a number of the interactive displays within the exhibit in the casually disinterested way that teenagers seem able to adopt at a moments’ notice, but as we explained why we were reacting the way we were, and explored the exhibition with her, a more animated interest began to blossom. Then Lady M and I went on the space launch simulator while she settled to try and catch up with her mum on Skype, using the exhibit’s free wifi. Eventually we pulled ourselves away, knowing we had only scratched the surface of what was there and headed home to rest up. We’ll be back. 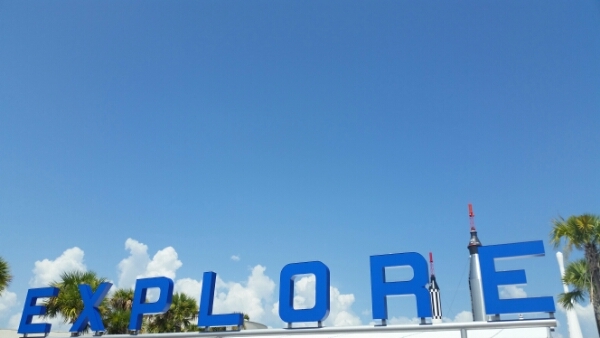 This entry was posted in family, Geekery, holiday, travel and tagged family, geekery, Holiday, kennedy space center, space, travel. Bookmark the permalink.